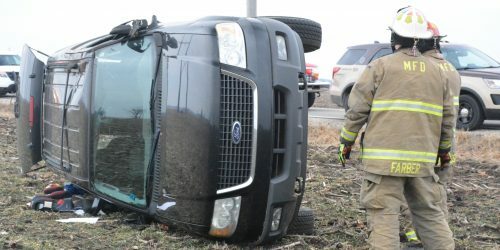 MILFORD — A black Ford SUV was involved in a single vehicle rollover accident at approximately 8:30 a.m. Wednesday, Feb. 27. According to a police report at the scene, the driver and lone occupant of the vehicle was traveling eastbound on W 900N when the vehicle left the paved roadway onto the berm on the south side of the road. The driver attempted to steer his vehicle back on to the road but overcorrected and crossed across both lanes of traffic and on to the opposite berm. A drop off on the north side of the road caused the vehicle to flip and roll. It ended up on its passenger side pointing to the west, approximately 20 feet from the road. The driver was treated at the scene for non-life threatening injuries. It is unknown if he was transported for further treatment. Milford Police Department, Kosciusko County Sheriff’s Office, Milford Fire Department and Lutheran EMS responded to the scene.